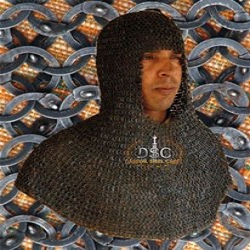 We are a leader in offering a best quality of Medieval Chainmail Coif to our clients. Worn with a helmet it gave a superb protection to the head. Is available in open links & close links. The coat of mail could turn aside the point of any dagger or ward off a spear or sword thrust. Aventails are available for helmets. Daniyal Steel Crafts was established in the year 2002. We are leading to Manufacturer, Exporter and Supplier of Chainmail Coif, Butted Chainmail Collar, Roman Helmet, Medieval Roman Shield etc. The production process of these products is managed by a team of skilled and experienced craftsmen, who make every piece exclusive through adopting the best production methods and contemporary designing measures. With expertise and experience, we have been able to craft the range according to customers preference and design. Our adept craftsmen make every efforts to create every single item with great attention, and owing to their efforts and competence we have been able to build up a wide client base. Apart from providing the above mentioned products in standardized forms, we also have the ability to offer customized solutions to the clients as per their needs and specifications. Made using superior grade raw materials our range is an epitome of strength and durability. All of our products are widely appreciated in the market field owing to their quality, performance and long application life. Our products are available in different designs, sizes and specifications as per the requirements of customers. In addition to this, we also ensure the delivery of varied customized range as per client's preference at competitive prices.